Welcome to hassle free fundraising. Cloud fundraising software done right. Every campaign can be custom branded to match the style of your organization. Brand your campaign in a few clicks to provide a seamless experience for your supporters. We provide the tools to promote your campaign. If your organization operates a website or uses social media, we have the tools to help you market your campaign. In a few clicks you can send your campaign to all your social media networks and add a one-click donate button to your website. Control every aspect of your campaign. Easily publish, unpublish, delete or edit your campaign at anytime. You are in the driver seat and you control every aspect of your fundraising campaign. Know your fundraising success at a glance. Create donation levels that match your organizations goals. 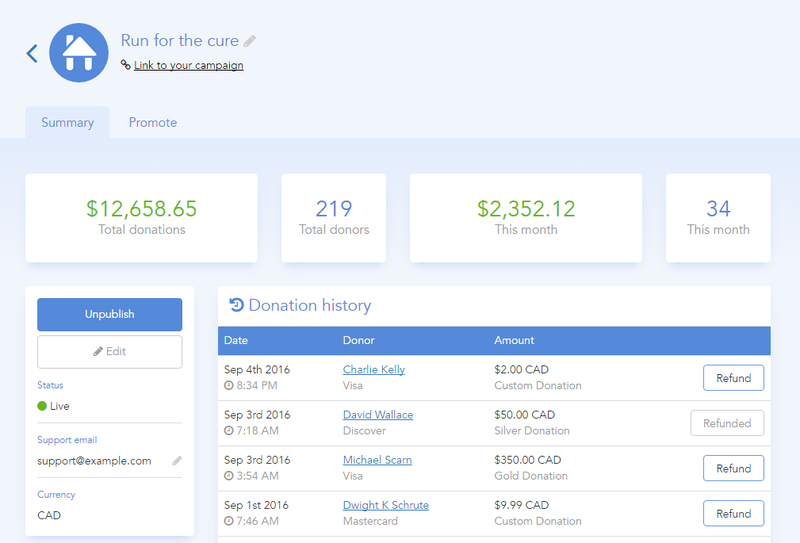 Attach custom donation levels to your campaign that includes a title, description and donation amount. This allows your organization to fundraise for specific items or services and provide details on each level to your supporters. Know exactly where your donations come from. Get a better understanding of donor network with accurate geographic details on every donation your campaign processes. Share and track your cause. Attach a fundraising goal to your campaign page and share the current status of your campaign with your supporters. Refund donations in one click. Provide great support to your contributors and one-click refund any donations you have processed. 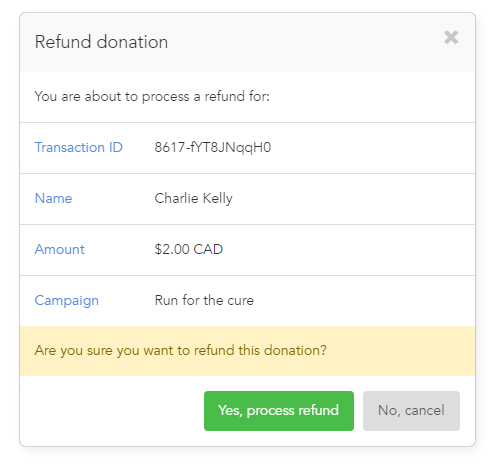 All refunds processed through the Dashboard return both the platform and processing fees to your donor. From your donors to your bank account. One of your generous supporters contributes to your campaign by providing their credit card information and authorizing a donation. Your donors information is securely processed by Stripe and their credit card is charged for the donation amount. Once this happens you instantly receive an email from both Stripe and Donorhut. Once the donation is processed the funds from your supporter are automatically sent to your bank account. You do not need to manually transfer the funds. Only pay when you are successful. Our simple pricing is ideal for charities of any size. Our cost effective approach to pricing is designed to keep funds in your organization. View our pricing details and pricing comparison. Do I have to be a registered charity / nonprofit? Nope. 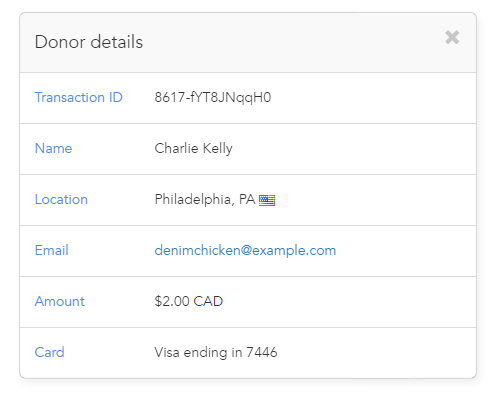 Donorhut works for all organizations (registered or not) and of any size. Can I add my charity / nonprofit tax ID? Yes. Registered charities and nonprofits can attach necessary tax identification numbers to all donation receipts. Yes, you have full control over all donations that get processed through your campaigns. When you process a refund to one of your donors the Stripe and Donorhut fee is fully refunded to the donor. Once a donation is successfully processed through your campaign both you (the organization) and the donor will receive email receipts for the donation. The email receipt sent to the donor contains vital information about your organization, the donation and any necessary tax information. Can I manage my campaigns on my smart phone? Yes! The entire Donorhut platform is device friendly. Meaning you can update, change or pause your campaigns from your mobile device, tablet or computer. In addition, your public facing campaign page is device friendly so your donors can easily donate using their phone, tablet or desktop computer. Does Donorhut have a mobile app?